The McMullen Museum, with Gasson Tower in the distance, on Friday, September 9, when more than 600 undergraduate and graduate students attended Art After Dark, the first in a series of events planned for students. Click image to enlarge. They very kindly built a new museum for our exhibition,” Harvard University professor Jeffrey Hamburger told a standing-room-only crowd before his guest lecture at the opening of the current show at the McMullen Museum of Art, on Sunday, September 11, 2016. The exhibition, Beyond Words: Illuminated Manuscripts in Boston Collections, marks an ambitious debut for the Boston College museum’s new home in the expanded 1927 Renaissance Revival building that was the Boston cardinal’s residence before the University acquired the Brighton Campus in 2007. A 15th-century book of hours from London, in the second-floor Daley Family Gallery. Click image to enlarge. Students view the Belgian tapestry Fourth, Fifth and Sixth Articles from the Apostles’ Creed (circa 1500), also in the Daley Family Gallery. Click image to enlarge. Smee described the McMullen’s new premises as “a wonderful exhibition space for an institution that’s been putting on some of the more interesting shows in the Boston area for a long time.” As examples of the McMullen’s range and scholarly ambition, he cited recent exhibitions exploring the philosophical dimensions of the art of Paul Klee (2012); the relationships among Portugal, the Jesuits, and Japan during the 16th and 17th centuries (2013); and the multiple influences shaping the paintings of Cuban surrealist Wifredo Lam (2014). Maame Aba Ewusi Mensah, an exchange student from London, looks at a 34-foot-long, 15th-century French roll that illustrates the history of the world, in the third-floor Monan Gallery. Student a cappella troupe the Dynamics performs in the museum’s atrium, during Art After Dark. Click image to enlarge. Netzer (at podium) gives an account of the museum before a standing-room-only crowd in a first-floor reception room, during the museum’s grand opening for faculty, staff, and neighbors on September 10. Click image to enlarge. Since joining the Boston College fine arts faculty in 1990, museum director Nancy Netzer has overseen more than 60 large-scale loan exhibitions, all involving new research and often breaking disciplinary boundaries. In her remarks welcoming guests to the museum on Saturday, September 10, Netzer outlined the development of the McMullen’s “outside-the-box” vision since the museum began life in the Middle Campus’s Devlin Hall in 1993. There may be something in the DNA of Jesuit universities that “promotes acceptance of multi-disciplinary endeavors,” said Netzer, citing the 17th-century museum of the German Jesuit priest Athanasius Kircher in Rome. The famed polymath’s wide-ranging collection of natural and man-made marvels influenced Jesuit scholarship for centuries. There is, she noted, more than a passing resemblance between the Collegio Romano, which housed Kircher’s museum, and the McMullen’s new premises. From the outset, Netzer saw faculty research interests as the major driver of exhibitions at the McMullen. Her goal was to cross methodological boundaries by fostering multidisciplinary research teams, whose work would “force consideration of unexamined and overlooked areas of the material world.” As a case study showing the fruits of this approach, Netzer highlighted the McMullen’s 2011 collaboration with the Yale University Art Gallery, Dura-Europos: Crossroads of Antiquity, which brought together classicists, archeologists, art historians, social historians, and historians of religion to reconstruct the life of the ancient city on the Euphrates using 75 objects, from military shields to religious wall paintings to children’s shoes. Pages from a 13th-century missal (left) and a 15th-century choir book on the second floor. Click image to enlarge. Netzer (center) during the museum’s opening. Click image to enlarge. Given the variety and unpredictability of the McMullen’s exhibition program, said Netzer, the most pressing need for the new museum was “large galleries with maximum flexibility, enabling display of a vast range of objects” while accommodating “shifting paradigms of scholarly inquiry.” In practice, that meant gutting the second and third floors of the original Brighton Campus building, raising the ceiling to 12 feet where possible, and adding track systems for moveable walls (and, on the third floor, offices). The first floor has kept its original grand reception rooms, with marble floors and high windows, and the walls are hung with American, Renaissance, and Baroque paintings from the University’s permanent collection. The space will be used for conferences, symposia, and concerts. In the tripartite exhibition that is Beyond Words, Harvard’s Houghton Library focuses on “Manuscripts from Church and Cloister”—on the centrality of books to monastic life—showing books mainly made by and for monks and nuns from the seventh through 12th centuries. The Isabella Stewart Gardner Museum’s portion, “Italian Renaissance Books,” explores the birth of the modern book in 15th-century Italy, and the importance of the Renaissance humanist libraries of scholars and princes as storehouses of intellectual and visual culture. “Manuscripts for Pleasure and Piety” at the McMullen Museum highlights the growth of a lay readership in medieval society, with both secular and religious works. The show occupies the entire gallery space of the new museum (at 5,600 square feet, roughly twice that of the former Devlin premises). With its display of 180 bound volumes, single leaves, and cuttings dating from the 11th to the 16th centuries, the McMullen show is the most extensive of the three. Jacqueline McMullen with University President William P. Leahy, SJ, before the La Farge windows in the museum named for her and her late husband, John. Photograph: Rose Lincoln. Click image to enlarge. Students during the early hours of Art After Dark on the rooftop terrace, which overlooks the Brighton Campus to the north and Boston to the east. Click image to enlarge. As Jeffrey Hamburger noted in his talk, “Before the scribe could write a word, an animal had to be slaughtered and skinned, its skin soaked in lime to remove the hair, a smelly process, and its surface laboriously scraped and smoothed.” Displays in the opening section give glimpses of the steps that followed: folded parchment pages nested into “gatherings” before binding, and sheets showing underdrawing— ghostly figures outlined in lead and brown ink. An instruction manual on the use of various scripts offers “a wealth of information about scribal practices,” according to the museum label, though the author’s “hand is rather sloppy.” And on an unfinished gospel page, a scribe left empty a large “Q”-shaped space, anticipating, assembly-line style, the later addition of an illuminated capital letter. One of the most massive books on show is a deluxe, elaborately bound choir book from the workshop of Jean Pichore in Paris. Made around 1510–20, it was designed to be displayed on a lectern and read from some distance by a group of singers during the Mass. More than two feet high, it is among the largest medieval books on record, size being determined by the expanse of the animal hide from which the parchment was made. Known as a Gradual (from when the singers stood on steps) and containing chants for the Mass, the book has been opened to the beginning of the Mass of St. Stephen and a miniature painting of the saint’s martyrdom by stoning. In a neighboring case is a diminutive gospel book, or evangeliarium, from early 12th-century Italy, small enough to fit into a person’s hand and likely to have been used as a private prayer book. Drawings of the Archangel Gabriel and the Virgin of the Annunciation (circa 1415–20). Photograph: Harvard Art Museums, Fogg Museum. Click image to enlarge. Medieval book production was a highly collaborative process. Illuminators often relied on so-called model books for artistic guidance and to confer on their productions the authority and accuracy considered crucial in religious texts. On display are two tiny, exquisite drawings (2 x 1.4 inches each), headshots sketched in early 15th-century Prague; one depicts the Archangel Gabriel, his curls wind-blown and his gaze upward, and the other the Virgin of the Annunciation, who, with her high forehead, narrow chin, and pursed rosy lips, is the paragon of contemporary beauty. The drawings would have been part of a collection portraying holy figures, intended to serve as models for use by artists in illuminations and other media, including panel paintings. Two rare surviving model books—a late 15th-century French compendium of botanical and costume studies and a book of bird designs for compilers of animal fables (bestiaries)—are among the 14 exhibits throughout the show accompanied by wall-mounted iPads that allow viewers to “turn the pages” of a complete digital facsimile and so overcome an inherent limitation of book exhibits, the fact that only one opening, or spread, can be displayed at a time. Set at half-brightness so as not to outshine the originals, the tablets enable exploration of the hidden pages and enlargement of details from the page on display. Left: Jean Pichore’s 26-inch-tall choir book (circa 1510–20), for reading at a distance during Mass. Photograph: Harvard University, Houghton Library. Right: A page from a 12th-century gospel harmony (11.2 x 7.5 inches) that merges passages from John and Luke. Photograph: Harvard University, Houghton Library. Click images to enlarge. Books of hours comprise “one of the great storehouses for the art of the late Middle Ages and Renaissance,” writes Wieck. A case in point is the Gardner volume illuminated by French court painter Jean Bourdichon (1457–1521), recently removed from its constricting 1969 binding and displayed behind glass in the McMullen, sheet by sheet. Next to the tapestry is another Boston College treasure, from the John J. Burns Library, a German Franciscan antiphoner from the first half of the 14th century. This well-thumbed compendium of music (9.6 x 7.3 inches) was used for the daily recitation of the hours of the Divine Office—prayers said at certain times of day by priests and other religious. It shows signs of wear and tear, with wax stains on some pages, according to Michael Noone, chair of the music department at Boston College, who co-wrote the catalogue entry with Australian musicologist Graeme Skinner. Although Noone’s ideal would be to have live performance in the gallery, visitors can enjoy at any time the next best thing on an accompanying iPad station: video of seven of the volume’s chants performed by Schola Antiqua, a group based in Toledo, Spain, specializing in medieval monophony (i.e., vocal melodies of one part). Painted miniature of St. Barbara, from a Belgian book of hours (circa 1480). 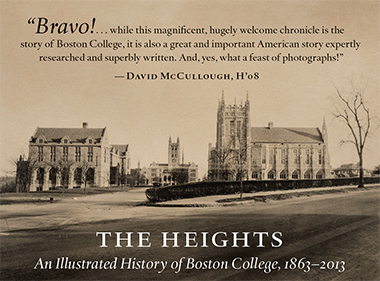 Photograph: Harvard University, Houghton Library. Click image to enlarge. The third-floor Monan Gallery transports visitors to Beyond Words into the realms of power and politics and courtly pastimes, including hawking and the tournament. Among the highlights is the first manual of conduct for women written by a woman, Le Livre des trois Vertus a l’enseignement des Dames (The Book of the Three Virtues for the Instruction of Ladies) by the prolific 15th-century author Christine de Pizan. While researching the catalogue entry, Boston College professor emerita Matilda Tomaryn Bruckner (Romance languages and literatures) relished the chance to study the whole text at its home in the Boston Public Library (BPL), magnifying glass in hand. Christine de Pizan, she says, was not only a writer; she also directed her own workshop and supervised the copying and preparation of her texts for various patrons. Handwriting analysis of the BPL copy, says Bruckner, suggests that at one point the author herself sat down and corrected a line that was being botched by a copyist. The centerpiece in the Monan Gallery also has a strong connection with female empowerment. Known as the Chronique Anonyme Universelle, this magnificent illuminated 34-foot-long French roll tells the history of the world from the Creation to the 15th century. It is thought to have been made for the Duchess of Bourbon, and, after her husband was captured at the Battle of Agincourt in 1415 during the Hundred Years’ War with England, “this text helped her learn how to be a ruler, how to manage things,” according to Lisa Fagin Davis of the Medieval Academy of America, who wrote the catalogue entry. Fagin Davis has spent 10 years studying the chronicle, and recently published a definitive study, La Chronique Anonyme Universelle: Reading and Writing History in Fifteenth-Century France (2014). In all her years of research on the roll at the Boston Public Library, she said, she only ever unrolled a small portion at a time. “You roll it up at the top and unroll it from the bottom, like a Torah scroll, and you make your way through it,” she explained. Seeing the entire Chronique unfurled in the Monan Gallery, “kind of takes my breath away,” she said. Page from the first conduct manual for women by a woman (circa 1405). Photograph: Boston Public Library. Click image to enlarge. After the exhibition closes on December 11, 2016, and the books and rolls are returned to their archival boxes, the curators hope that the collaborative scholarly effort behind Beyond Words will have an afterlife, inspiring a new generation of medieval scholars. The 375-page fully illustrated catalogue, with its international roster of contributors, is part of that legacy. As is the show’s website, beyondwords2016.org, which contains a searchable database of all objects on exhibit, with full physical descriptions, and digital facsimiles of at least half the manuscripts, and funding to cover updates for at least the next five years. On January 29, 2017, the McMullen Museum’s next exhibition will open, offering works by the Cuban painter Rafael Soriano. Titled The Artist as Mystic, it will run through June 4, 2017.